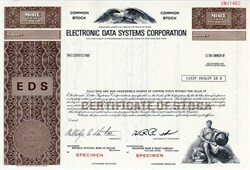 Beautiful specimen certificate from the Electronic Data Systems Corporation of Texas . This historic document was printed by the Security-Columbian Banknote Company and has an ornate border around it with a vignette of an eagle. This item has the printed signatures of the Company's President, and Chairman of the Board, H. Ross Perot. Henry Ross Perot born June 27, 1930) is an American businessman best known for being an independent presidential candidate in 1992 and 1996. Perot founded Electronic Data Systems (EDS) in 1962, sold the company to General Motors in 1984, and founded Perot Systems in 1988. Perot Systems was bought by Dell for $3.9 billion in 2009. On February 20, 1992, he appeared on CNN's Larry King Live and announced his intention to run as an independent if his supporters could get his name on the ballot in all fifty states. With such declared policies as balancing the federal budget, opposition to gun control, ending the outsourcing of jobs and enacting electronic direct democracy via "electronic town halls", he became a potential candidate and soon polled roughly even with the two major party candidates. With an estimated net worth of about US$3.5 billion in 2012, he is ranked by Forbes as the 134th-richest person in the United States.